Mid-1800s, pine, Inner Mongolia. Attractive simple floral paintings and pair with narrow size easy to arrange in any room. 58” h. 25” w. 17½” d.
Mongolian design is similar to the Tibetan style of painting, which consists of lavish, wide brush strokes and vivid colors. What distinguishes one from the other is the number of colors used in paintings. Most Mongolian pieces contain three dominant colors: yellow, green, and red, as exhibited on this pair of chests. Pine was abundant in this high country and so was used in construction of the majority of furniture. Each chest is constructed with a black framework, with the body divided into three sections: an upper and a lower storage compartment separated by a drawer. 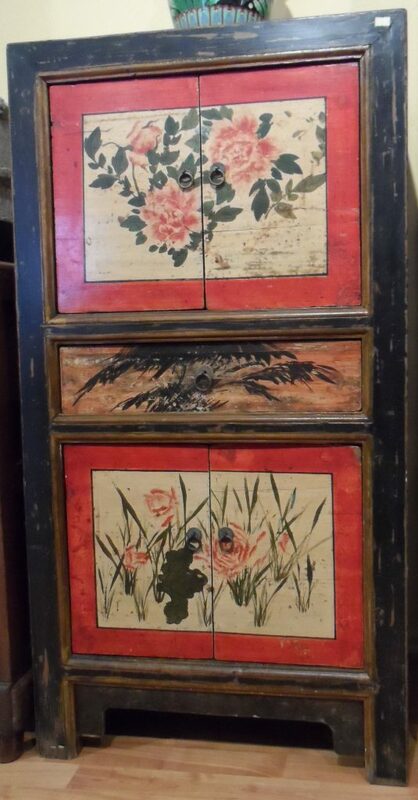 The storage compartment door panels are painted with red flowers and dark green leaves on a white ground surrounded by red matting. The narrow drawer front is decorated with painting of some dark color palm-like leaves. All the panels are set within a saffron color raised molded frame. Old iron rings act as door and drawer pulls. A plain black apron sits recessed below another saffron color molding. This pair of narrow chests would look very attractive arranged singly or side-by-side in any room today.